Normally the generators are coupled in parallel at most of the power station through bus-bars. Bus-bars have positive and negative terminals and they must be dense thick copper bars. The positive and negative terminals of the bus-bars are connected to the positive and negative terminal of the generator respectively. 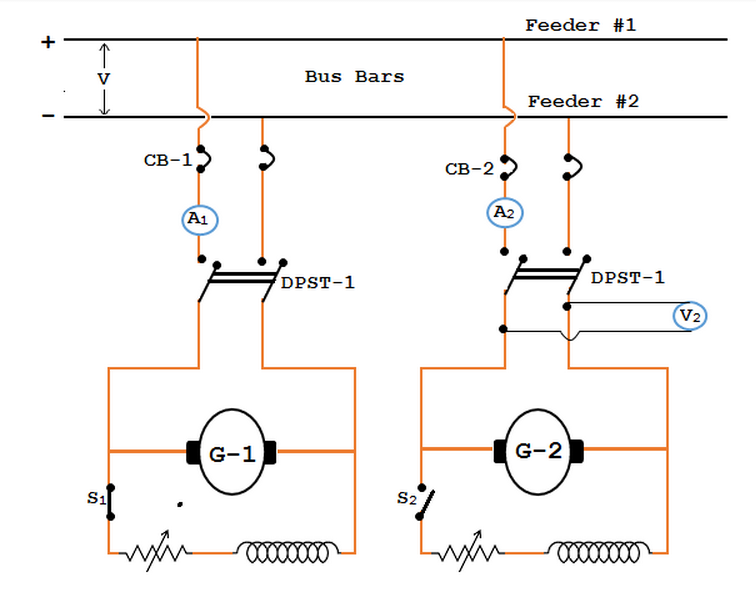 The above figure shows the shunt generator No.1 is connected to the bus-bars and delivering load. The shunt Generator No.2 is connected in parallel to the Generator No.1. When the load on the generator No.1 increases beyond its rated capacity, immediately the second shunt generator operate and wish the first generator to come across the raised load demand. First the prime mover of second generator is taken up to the rated speed. Once starts running at its rated speed the field circuit of the second switch S2 is closed. Afterward close the second breaker (ie. CB-2) and the excitation of second generator is varied till it’s generates voltage identical to the bus-bars voltage. It is shown by voltmeter V2. Now the second generator is in parallel with the generator No.1. The generator no.2 will not supply any load when it is connected in parallel with generator No.1, since its generated EMF is same as that of bus-bars voltage. At this juncture the generator is assumed to be “floating” on the bus-bars. Once generator no.2 supply any current, then its generated voltage E ought to be more than the bus-bars voltage V. In such case, the current delivered by it is I = (E - V)/Ra. The generator No.2 can be made to supply appropriate load by raising the field current and so the induced EMF. By varying the field excitation, the load might be lifted from one shunt generator to another. In consequence if generator No.1 needs to be halt, then the entire load moved onto the generator No.2 if it has the ability to deliver that load. In such case, decrease the current delivered by generator NO.1 to zero. It is shown in ammeter A1. Finally open the circuit breaker No.1 and then S1 switch. Author: CSV is an electrical engineer living and working in India. He regularly writes and enjoys sharing Technical Information in the diversified field of engineering.